I have never denied my preference to American food compared to any other cuisine.. save for Chinese. Maybe because it's because I'm a simple meat and potatoes guy, and a lot of american dishes are straight up, no frills comfort food cooking. Which I think is pretty much what Kettle has nailed. And since that's my favorite type of food, it will come to no surprise to you that, despite my own hectic schedule, I've made it a point to visit there at least once a month for the past three months. Yes, Kettle is THAT good. The place was a tad crowded when I was there all three times, so It was rather difficult to get a good shot of the place. 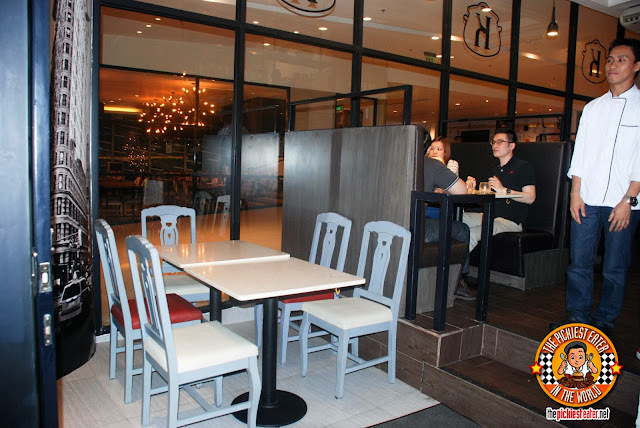 But expect to be seated in the outside mall area. The place gets packed really quick. Inside though, you'll find decors that invoke Americana. 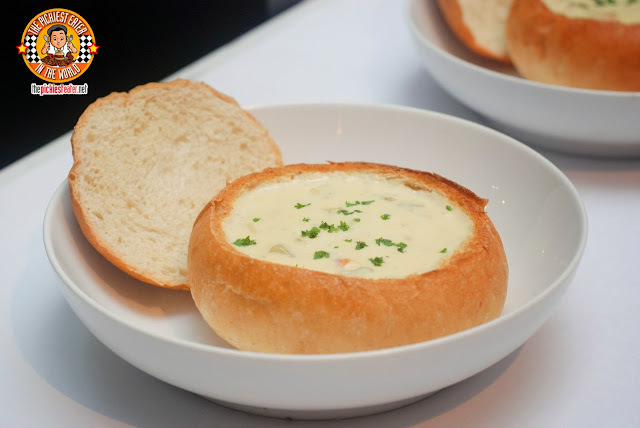 The Clam Chowder P229) was deliciously creamy, and had healthy servings of clam that paired perfectly with the Sourdough bread bowl. 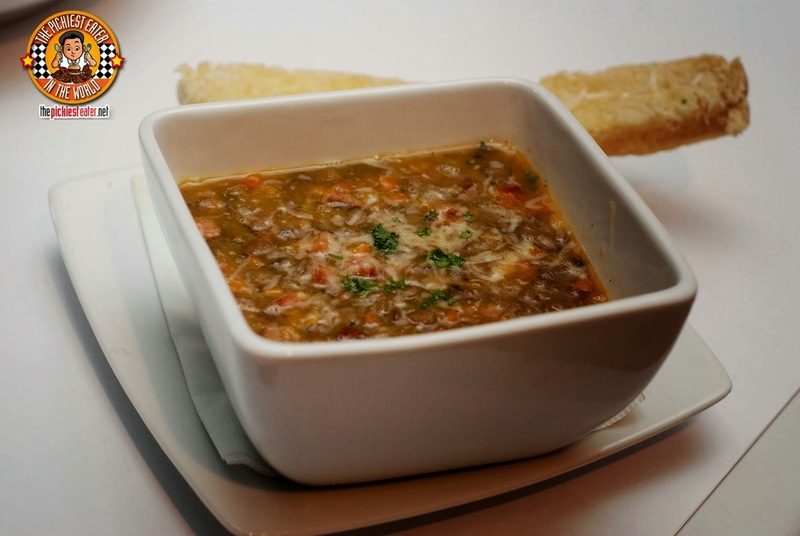 I'm not a fan of Lentils, but if you are, you might want to check out their Lentil & Sausage Soup (P219). It's filled with crumbled Garlic Sausage, a medley of summer vegetables, and French Green Lentils. 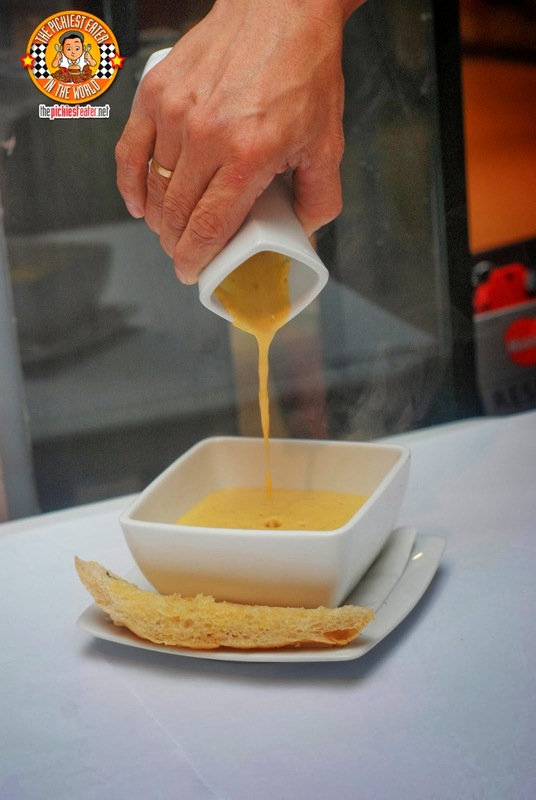 The Oven Roasted Squash Soup (P249) had a unique take on the comfort food classic. Kettle's version is presented in a "deconstructed" way, with the bowl they place in front of you empty save for bits of shrimp salad. 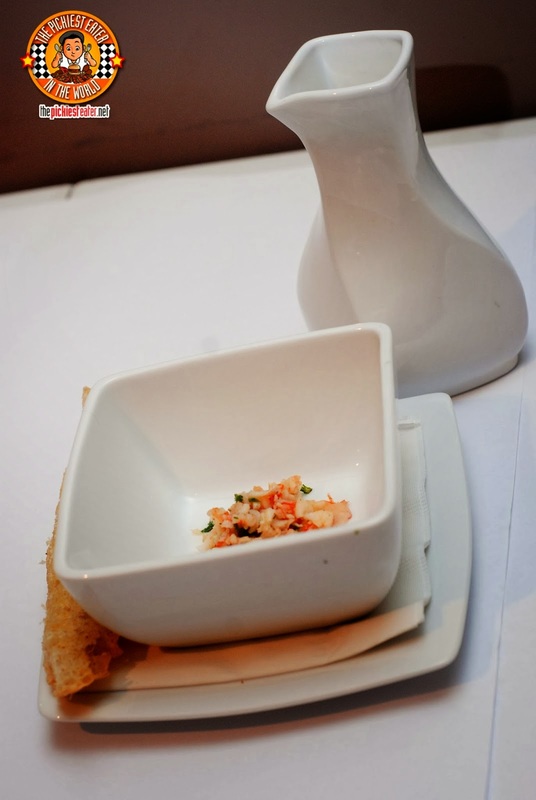 The steaming soup is then poured out from a decanter, and you then mix the shrimp around its milky bath. 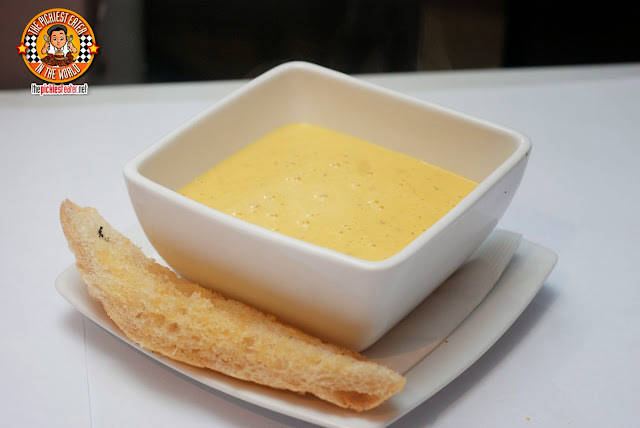 The soup had a delightful touch of sweetness to mix with the rich taste of the squash, and shrimp. Call me old fashioned but, as delicious as this was, I prefer my squash soup without shrimp (I found myself picking out the shrimp bits with my spoon). The Pork & Potato Strips (P339) had RichieZ written all over it. Thin strips of deep fried potatoes, mixed in with bits of crunchy pork belly, with some fresh herbs thrown in, and a bit of cheese, with a red pepper aioli dip for added punch. I may be wrong, but I swear a tasted a bit of truffle oil in here as well. This was magnificent, but I must warn you.. it's deceitfully heavy. You'll find yourself eating this by the fistful, and by the time your meal comes, you realize you stuffed yourself with the appetizer. I'm going to tell you this right now. Kettle makes some of the best sandwiches I've ever tried. How good are they, you ask? 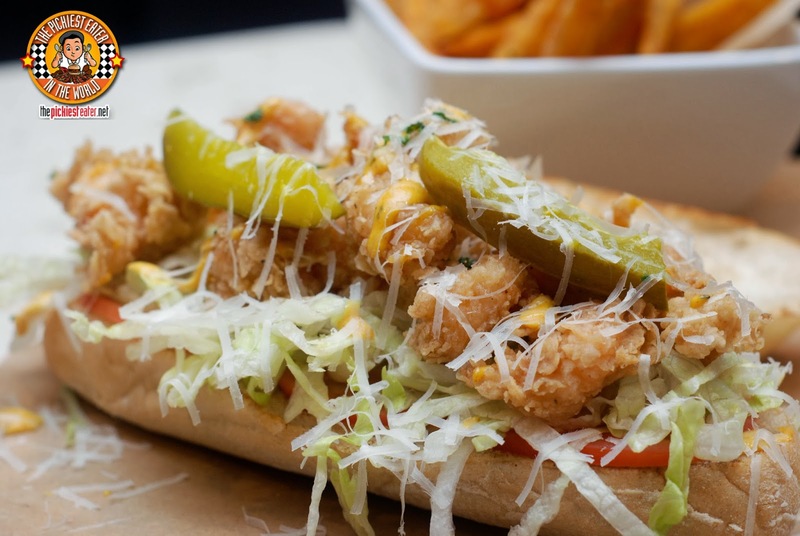 Well, let's start with the Shrimp Po' Boy (P419). Remember how I told you how I was picking out those little bits of minced shrimp from my soup? Well, in the case of my Po' Boy, if anyone tried to grab a piece of shrimp that fell back on to my plate from the sandwich whilst I was trying to take a bite risked losing a limb. This was messy to eat no doubt, but I loved every morsel of it. The shrimps were plump, with the Cajun coating seasoned perfectly, giving a little zing to it, yet blended beautifully with the remoulade. The bread was incredibly soft and tore away cleanly with every bite. I repeat, I DON'T eat shrimp. But I could have finished this easily. Since my trip to New York in 2012, I've been in search of a place that could come remotely close to the Reuben Sandwich I had at Katz's Deli. 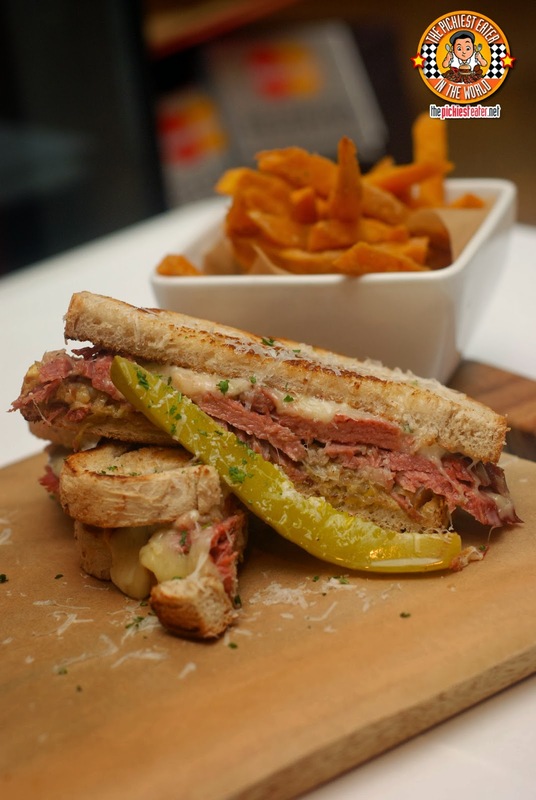 I had no expectations when I tried Kettle's Reuben (P489), but I was pleasantly surprised with how it blew me away. The Honey Oat bread was buttery and soft, and the Pastrami was meaty and packed with flavor, with a stunning tanginess to the sauce. This is one of the best sandwiches I've ever had here in the Philippines. Just like their sandwiches, Kettle pulls no punches when it comes to their Half Pound Angus Burger (P419), but it doesn't rely merely on its size to impress. 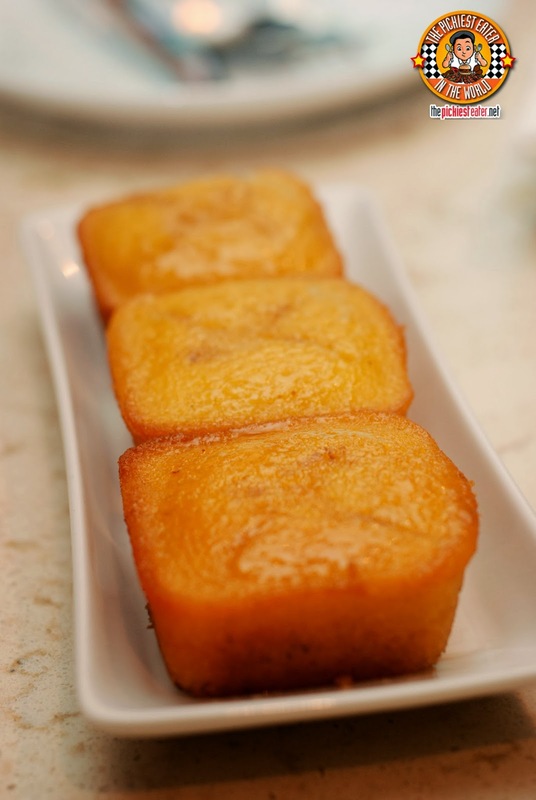 It makes use of simple, yet exquisitely tasty details. 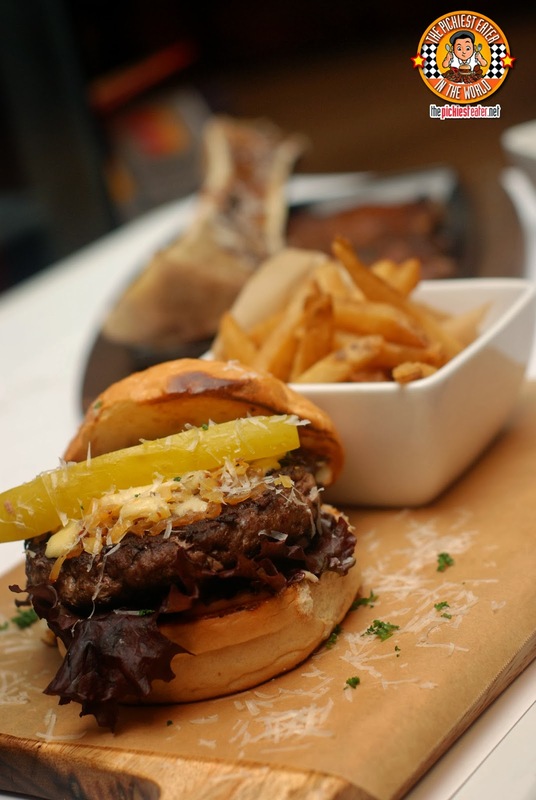 The patty alone is quite the behemoth, but is seasoned masterfully, and remains extremely juicy and flavorful. 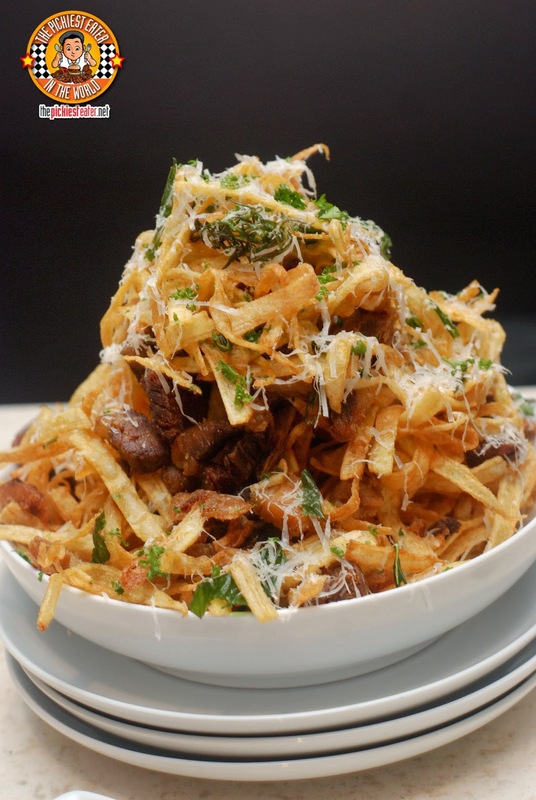 The gentle laying of caramelized onions joins the sprinkling of the smoked white cheddar in a playful dance on your tastebuds, while the horse radish dressing offers a tangy balance to your dish. Though the Western influence on Kettle's menu is highly evident, it didn't fail to pay a little homage to it's Filipino roots. Kettle took the liberty of adding a little spin to a classic Pinoy comfort food dish, by creating the Australian Lamb Adobo (P449). 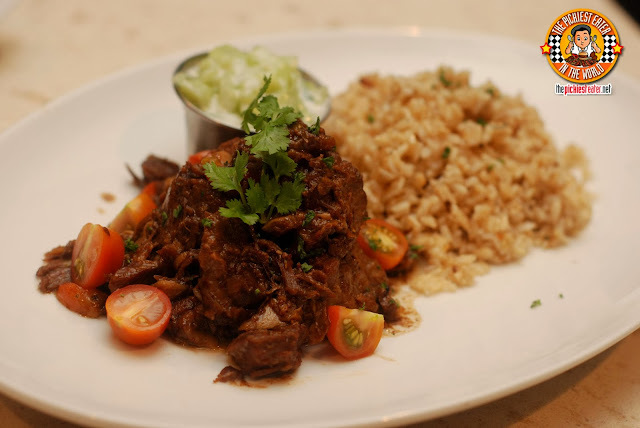 The dish had melt in your mouth, tender chunks of delicious slow cooked lamb, stewed in the adobo style that we all know and love. The dish is served with a side of truffled mushroom brown rice and Tzatziki. 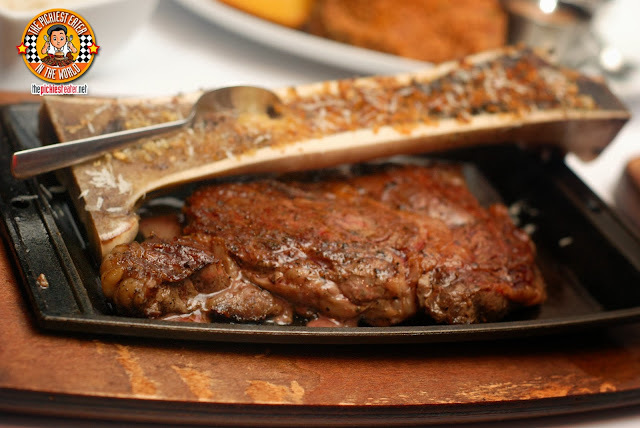 The room literally came to a standstill the moment the Steak and Marrow (P2,589) was brought out of the kitchen on a still sizzling platter. Even simple mall goers who happened to be walking past Kettle as the steak was being brought out came to a stop to gaze at this beauty. This was a glorious 450g USDA Prime Aged Ribeye Steak, with a Bone perched no top, with its herb crusted marrow still intact. Something you definitely must try. As impressive as the Steak and Marrow is, without a doubt, the true gem of Kettle's menu is their Buttermilk Fried Chicken (P519). I had the pleasure of having some delicious Buttermilk Fried Chicken a few weeks earlier, and since then I've been hooked. I was eager to give Kettle's version a try, after reading from just about everywhere about how amazing it is. And let me go on the record to say it..
Everything you heard was true. 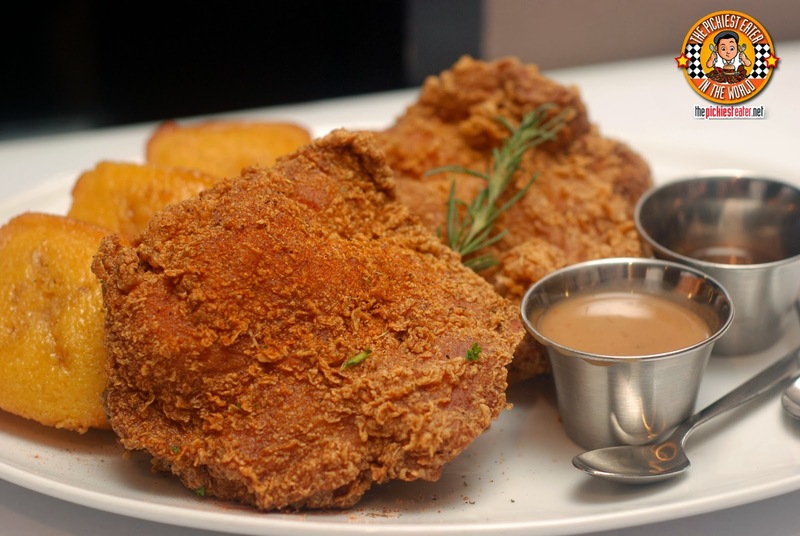 Kettle's Buttermilk Fried Chicken is one of the best friend chicken I've ever had. One bite of this glorious piece of chicken will make you remember everything that is right in this, cruel, crazy world. First off, the beauty of it begins with it being boneless. A huge boneless thigh fillet, dipped in a buttermilk base batter, and deep fried to golden perfection. The dish comes with a side of Country Gravy and Cajun Honey for you to choose from, but I opt to mix both for a nice mix of sweet and savory. Though Rina was looking for rice (as usual), i felt that the chicken was best enjoyed with the delicious Honey Glazed Cornbread Muffins, giving it a more Southern Home Cooking feel. As happy as I was with the entrees, I did feel that some of their desserts needed a little bit of work. Two of them were just average, while the other two were actually quite good. Though you could certainly appreciate the amount of care that was necessary in order to created Kettle's Checkered Cake (P209), taste-wise, it wasn't anything truly outstanding, with the cake itself being just a tad but dry for my liking. 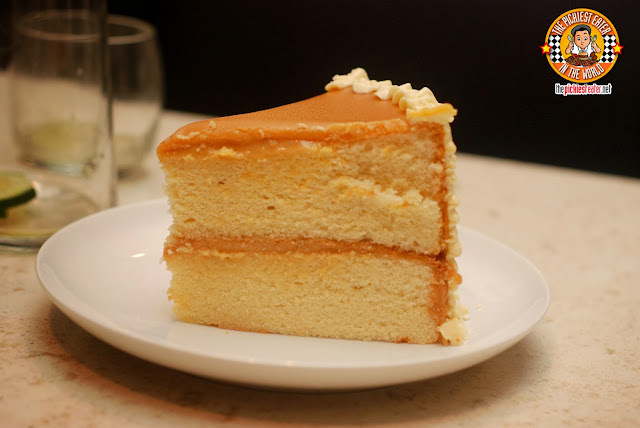 The Caramel Cake (P189) was also good but nothing truly memorable. I've had some good caramel cake's before, and this would have gotten lost in the shuffle when compared to the others i've tried. 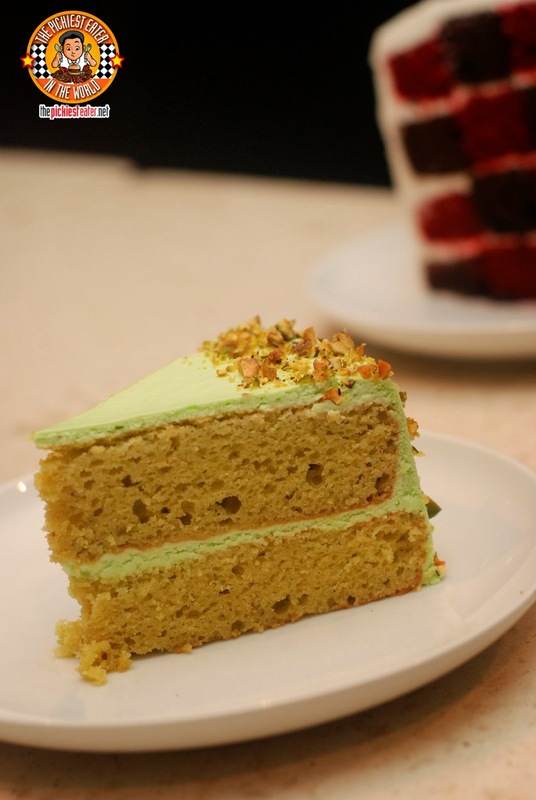 A dessert that I enjoyed very much was the Pistachio Cake (P229). The moist chiffon cake was slathered in a frosting that had the unmistakable flavor of Pistachio, that I couldn't get enough of. I also really enjoyed the Banana Cream Pie (P149). 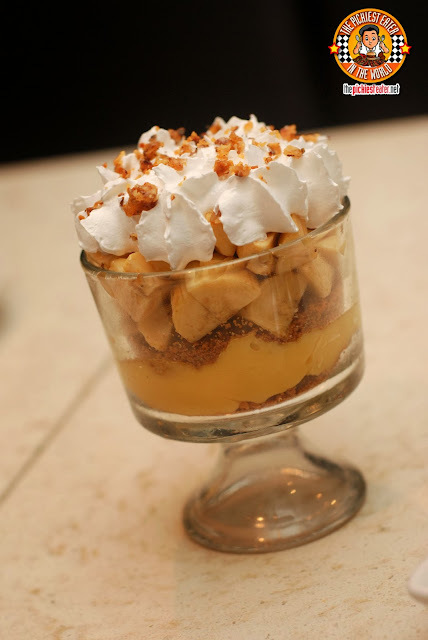 Though it seemed more like a trifle than a cream pie, I enjoyed the mix of freshly cut bananas, mixed in with custard, graham crumbs and whipped cream, elegantly presented in a glass instead of a pie tin. Though I enjoyed it as is, I would suggest they try it with flambeed bananas.. just to see what is better. Others might find it too sweet but I wouldn't mind giving it a shot hehe. Since my first visit in November, I have been back to Kettle two other times, even celebrating my birthday with my family there. Each time we visited, we tried different dishes, and discovered it was also quite amazing. Other dishes we have tried and enjoyed, were the Baked Brie, Angus Short Ribs, and the Angus Roast Beef hash. But personally, I would always find myself going back for the Buttermilk Fried Chicken. Congratulations, Kettle. You have made it to my list of favorite restaurants! When I read your blog, I'm made aware of my amateurish way of reviewing food hahaha.. But oh well, it's actually one of the reasons why I consider you as the best food blogger there is, I just don't comment a lot but I do read your posts. 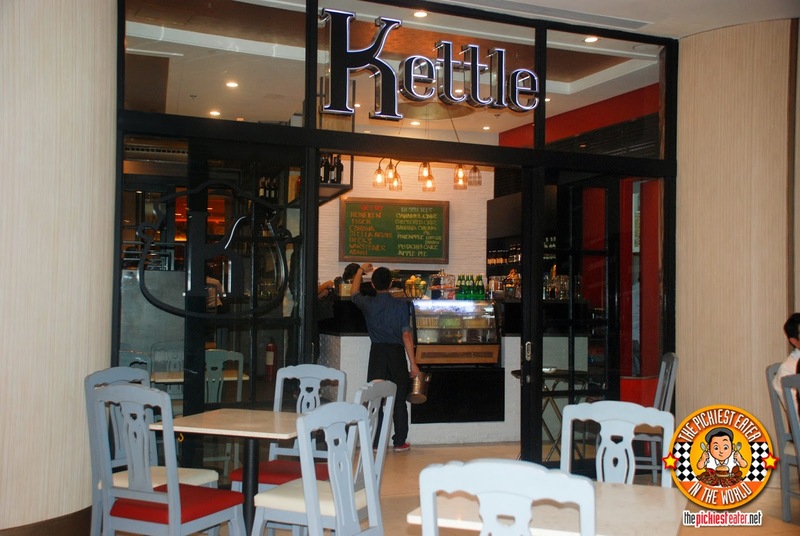 Anyhoo, this is the first time I've heard of Kettle, maybe because I don't frequent Mandaluyong. But I am overwhelmed by the serving (if I'm seeing it right), though it's a bit pricey, I think one can get his money's worth. The pork and potato strips looks quite interesting but I don't think I'd take an appetizer if ever I eat there because I get stuffed easily. Out of all the foods, I think I am going to try, Reuben and the pistachio cake. 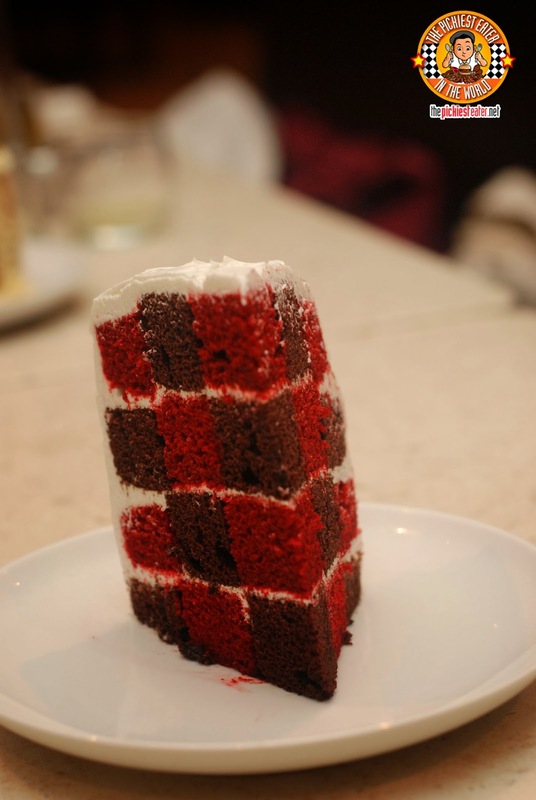 I am going to take your word for it and not try checkered cake, no matter how interesting it looks. Thank you for your wonderful comment, but I just wanted you to know something.. There is absolutely nothing amateurish about how you do your food reviews, and I encourage you to keep doing what you're doing, because I enjoy reading your blog :) Besides, who's to say who is an amateur and who's a pro? As we're enjoying what we're doing, then that's all that matters. Perhaps i'll see you in a blogging event some time! Thank you again, and i'm looking forward to reading more of your posts! Dude go for the Reuben!!! Eating here now. And I used you as a menu. Harharhar!